[MOD] Isra NPC for BG:EE, BGT & TuTu released! And for our final release this 12 Days of Christmas, we have a new paladin NPC from Rhaella, author of Adrian and Ninde ToB, for BG:EE/BGT/TuTu! Isra is a follower of Sune Firehair, the goddess of love, beauty, and passion, and the only chaotic aligned deity to sponsor paladins. As such, she isn't necessarily what you might expect of a paladin. She associates with some of the most mirthful churches in the Realms, so for the most part, she lacks the solemn edge that's so common for the class. She definitely still believes in honor, discipline, and order, but she tends to value the courtly aspects of the code of conduct more highly than the demands of duty. As a result, she's usually pretty willing to ignore harmlessly chaotic behavior (not evil behavior, though). Isra is Amnish, most recently from Crimmor, the Caravan Capital of Amn. She's a squire with the Sisters and Brothers of the Ruby Rose, and you can find her in the Nashkel Mines region, trying (with no success whatsoever) to resolve Prism's legal difficulties. Aid her in protecting him from Greywolf, and she'll be happy to help you investigate the mines. Make sure you recruit her before clearing them, however. They pose enough of a threat that she'll be willing to take action first and seek permission later; otherwise she'd feel obligated to return south to her order instead of gallivanting off with strangers. She won't join the company of an evil PC under any circumstances. She won't be rude about it, but she does have the magic to tell. She also won't stick around if your reputation drops below 6. Isra is compatible with BGT, Tutu, and BG:EE. If BG:EE is installed, she does have additional banters with the new NPCs (though don't expect it to be pretty in Dorn's case). There is no BG2 content at this point, though it is intended in the future. Isra will befriend any PC of good or neutral alignment whose reputation is at least 10. The friendship track consists of 13 talks. It begins soon after leaving the Nashkel Mines, and is somewhat (though not entirely) chapter dependent. She has no quests in BG1, though you'll probably see the seeds of issues that will be arising for her in BG2. Isra's got a large and somewhat colorful extended family. She's not a romance option in BG1. Good-aligned protagonists of any race or gender with 13+ Charisma may start to meet with some interest, but she won't really let it go anywhere. She's young and very conscious of the stereotypes associated with her faith; not reinforcing them is still pretty important to her at this point (though she fails at that sometimes). 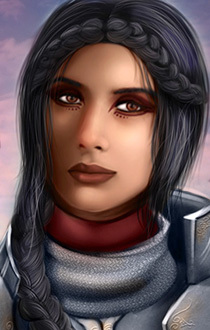 She is intended to be romanceable in BG2, however. If you want to choose NPCs by how much they talk, Quayle, Tiax, Faldorn, and Shar-Teel only have one banter a piece. Dorn sort of has one, but it's more an ultimatum than a banter. Branwen, Coran, Dynaheir, Imoen, Khalid, and Jaheira all have three (as does Eldoth if Skie is around). Everyone else has two. She tends to get along with most of the good and neutral aligned folk, though there's a bit of religious tension with Ajantis at times, and Branwen as well (Sune hates Tempus; Tempus doesn't care). Rasaad is probably somewhat interesting from a religious perspective also. She gets along really well with Khalid, though there's some tension with Jaheira. She may be crushing on Dynaheir a little bit, though it's a bit hard to tell. Her relationship with Coran is more than a bit mercurial. She does not like Safana at all, while Safana mostly just finds her amusing. The only NPC she won't travel with is Dorn (for obvious reasons). She's pretty leery of Viconia as well, but they mostly just stay away from each other. She won't actually get along with any of the evil NPCs, but she believes in due process; she's not going to just murder someone. I guess each to their own but she's the 2nd hottest female I've ever seen on BG series! I would have personally preferred undead hunter (well, maybe I have watched buffy the vampire slayer at some stage...) but cavalier sounds like it fits her well. Thank you! @smeagolheart Sure it does; "She's a squire with the Sisters and Brothers of the Ruby Rose, and you can find her in the Nashkel Mines region, trying (with no success whatsoever) to resolve Prism's legal difficulties." Glad you guys seem to like her, let us know what you think! I really like the idea behind this NPC (when reading it I thought she was Chaotic Good! lmao). Definitely going to try it on my next playthrough!! I wonder what her Weapon profficencies are...? Haha! Yeah, an undead hunter would have probably made some sense as well, but Sunite paladins pretty explicitly go after the ugliest, most horrific things around, which makes them seem like a bunch of cavaliers to me. Nope, she's definitely lawful, and pretty particular about her own behaviour, though she's not at all rigid about it. Granted, I think a lot of the qualities normally associated with paladins are due to their religious beliefs rather than being inherent in the alignment, so her Lawful Good tends to look a bit different than Keldorn's or Ajantis's. @Rhaella That's more than understandable, for instance... Neera's Chaotic Neutral is different than Haer'Dalis' and so on. That all makes sense. I would love to try her as soon as possible, so I think I'll just start a new game as early as possible. This looks great looking forward to checking it out! I'm mad at myself for missing this. I started a new playthrough to try out Valerie a couple of days ago. I guess I'll just console her in, ctrl-q and hope nothing breaks. **** it. Installed, and saw there was cross-mod banter. Time to start over. I've only run into one issue so far... when first bumping into Isra (by Prism), it looks like Isra is supposed to say something, but I just got a dialog string #. (I cannot recall exactly, but I think she tries to say something as you near Prism, but before you have spoken to him) The rest of her interjections (once I clicked to talk to Prism) showed without issue. Sorry for the lousy reporting... I did not even notice it the first time, and the second time it did not bother me enough to stop (and all other dialogues, including inter-party banter) seemed fine. @XKal, that's definitely weird. Did you click on her before this happened? She does have a default comment if you try to talk to her instead of Prism, but she isn't scripted to say anything herself at that point. Unless it's some bizarre cross platform error, my only guess would be that it's a soundset dialogue string issue. @Deucetipher, I'm preeeetty sure that the crossmod would still fire even if she were consoled in, but if you've already finished Prism's story... yeah, there's scripting there which would probably break. I started over post-installation, and I've picked up both Valeria and Isra, and am equipping them before heading to the mines. Got Isra the two-handed sword +1 and the dex gaunts and ankheg plate, so she's ready to roll. Got Evermemory for Valerie, so it's time to start a questin'. I had already started Cloakwood Mines on my last playthrough, so I thought that it'd be better to start over than engage in shenanigans. I did have some weird issues pop up with Dorn's ambush, but I'd be surprised if it was due to anything y'all did. That encounter seems to be a bit unpredictable in a vanilla ee install. I had posted saying that I could not reproduce this, but just did. It looks like maybe the text Isra says as ambient dialogue when idling around her (and before talking to Prism)? this looks excellent, i can't wait to try her out. this would be my first ever mod used on bg:ee (or vanilla bg). do i simply download, unzip and drop into the override folder (which i have already set-up under the 0076 (whatever) folder)? @mjs Unzip the mod into your 0076 folder, click "bgee_install_isra_setup.bat," and follow the instructions. Make sure you unzip the file into your game folder and not somewhere else, or it won't work. Can you describe exactly the steps you're taking, where you're putting the files etc for me? I've installed this as part of testing WeiDU for OS/X (worked fine on top of several other mods). I'm seeing something strange, though. When she addresses me, I see PRO_LORDLADY and LORDLADY instead of the actual strings "lord" or "lady". I'll try installing this on top of the real MacBGEE when that drops on Friday. I corrected an identical issue semi-recently, but that was only for BGEE. Old behaviour is still preserved on my Wine'd BG2. I'll take this to PM, since it is not related to Isra. I am indeed using BGEE (via Wine). Just wanted to drop in and say that I got Isra installed on OS/X using the weidu-osx-intel binary posted elsewhere, and she seems to be working correctly. This time, I used an explicit "--script-style BG2" and she's saying "my Lady" etc. correctly. I'm using a BWP assembly with Isra's mods for BGI and II. Question: if I have her in my party for some time in I, but not always (and don't finish the game with her), will the BGII dialogs recognize that we've met before? @Valikdu - You'll get a chance at the beginning of BGII to verify whether or not you've met her before. There's no automatic carry-over one way or the other. Isra will not join my party. I am Chaotic Good and have Imoen, Rasheed, Finch and Xan in my party. None are evil I have a 16 Cha and my rep is Popular. I can see no reason why she would just walk away except perhaps that I've already cleared the Nashkel Mines. Does anyone know why this is happening or if I need to get her earlier in the game?